Dang has been shut down even on Thursday protesting against the decision to not announce the district as temporary capital of Province 5. Transportation, educational institutions, factories shops and all other institutions have been shut down since early Thursday morning as on Wednesday. The East-West Highway has also been blocked. 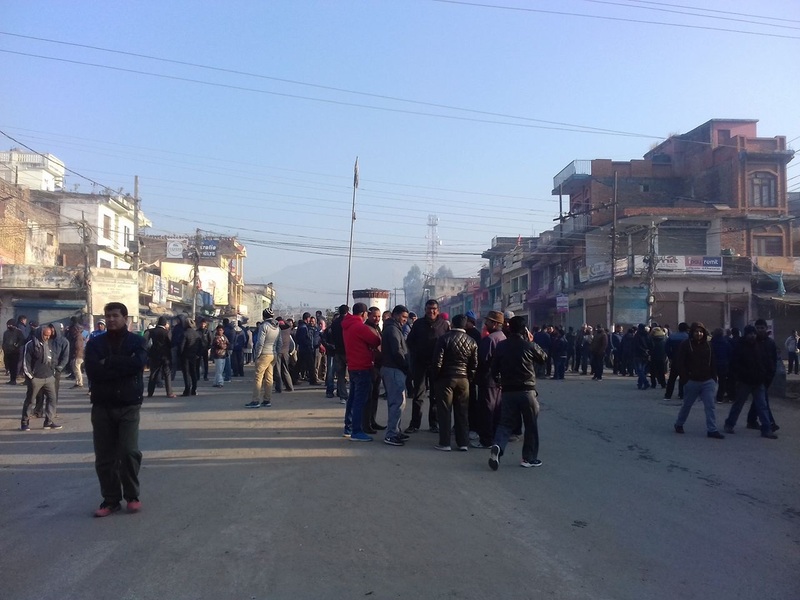 All those taking to the streets are commoners and no political leaders can be seen on the streets even though youths affiliated to Nepali Congress (NC) and Nepal Students’ Union earlier had also called strike demanding Dang be made provincial capital. Cell phones of the majority of elected people’s representatives from the district are switched off. CPN (Maoist Center) leader Krishna Bahadur Mahara, who has been elected to the House of Representatives (HoR) from Dang-2 and CPN-UML leader Shankar Pokharel, who has been elected to the provincial assembly from Dang-2(B) and proposed as the chief minister of Province 5, have already protested the decision of not announcing Dang as temporary provincial capital. Mahara has issued a press statement demanding that the government should immediately correct the decision while Pokharel has called the decision imprudent. An all-party meeting has been convened in Ghorahi to decide about the future course of action. But a meeting of Dang capital stakeholders committee Wednesday night has already decided to further intensify the indefinite strike. It has declared January 17 as a black day and urged the people to flutter black flags in every house. It has decided to completely shut down all the government offices apart from hospitals. The whole market including the hotels will be shut down, autorickshaws and rickshaws will also be stopped and ambulances will be allowed to ply only after checking whether they are carrying patients or not. It has also decided to take all the elected people’s representatives in the district hostage to affect the upcoming National Assembly election, stop all leaders and government representatives from entering the district, disrupt the National Assembly election for the province to be held in Dang on February 7, not pay any kind of tax, and intensify the highway-centric protest, according to member secretary of the committee Sabin Priyasan.